Sol Nessebar Palace hotel offers unforgettable summer vacation in a new modern luxuriously equipped complex with a wonderful sandy beach, attractive sports activities, excellent Bulgarian and international cuisine as well as special areas for health and beauty for relaxation and recuperation. Location: 2.5 km south of Nessebar, one of the oldest European towns, situated on a small peninsula. The hotel has a wonderful view over the sea and the small village of Ravda which is only a few minutes walk from the hotel. Soll Nessebar Resort offers family rooms, which are very comfortable for families with kids. Each family room offers 2 interconnected standard rooms. Guests can use 4 regular and 2 additional beds in each family room. The complex offers 3 outdoor and 3 indoor swimming pools, as well as a separate children pool with a castle and 3 water slides. 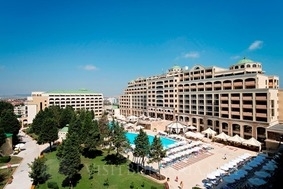 Guests of the complex can use fitness hall, free internet, medical service, billiards, darts, table tennis. The complex offers 3 tennis courts with night lighting, basketball and voleyball playground, football field, multifunctional playground and mini golf. The complex also offers a covered outoor stage for show programs and games, as well as animation for children and parents. The restaurants in the complex offer always fresh food with guaranteed qualities. The great variety of fruits and vegetables is exceptionaly important for the children. The 3 storey building of spa centre “Rosa” will pamper your sences with aroma therapy, turkish bath, Spa capsule, Finnish and infrared saunas, massage zone, ice showers and VIP zoen. Special cosmetig and beuty procedures. Private beach: Sol Nessebar Complex offers a sunny terrace with free sun beds and parasoles, as well as a all inclusive beach bar, in close proximity to the beach. The beach also offers numerous beach sport activities as catamaranes, threemarans, pedal boats, bananas and etc.